Baseball, Hot dogs, and Spring! Easy perennial flowering plant.Loves the shade as well as partial shade. In January comes the snow…. and ice and wind… “what’s a gardener to do?” This year I have a library outside my garden that supplies free books to the neighborhood. It is called a Little Free Library and they are popping up all over the country. The motto is take a book, read a book and return or donate a book. No library card needed because it’s on the honor system. Well there’s an idea we don’t use often. “Where do the books come from?” I am frequently asked.”Donations and thrift stores”are my answer. Did you know that once a book leaves a store it devalues just like a car. That Dr. Seuss book you just got your child is now worth a penny. Don’t believe me then try one of the many apps like Bookscouter that reads the UPC on any book and tells you the buy back value. So what does a gardener do in the winter? This year I have become a librarian in a wired kind of way. Cook books, fiction, nonfiction, poetry, and children’s books are stacked in my basement waiting their turn to be placed in a new home. What’s even better is that I get to read some amazing books and share my love of books with others. So next time you see one of these libraries in your neighborhood stop and check it out maybe you’ll be presently surprised. Scouts honor. It’s finally here. After months of cold wet wintry weather spring is officially here. I have been outside working on weeding, transplanting and cleaning our my garden beds. It will be a long time until I am able to pick a beautiful garden bouquet but working outside now will save me hours of work. Spring is officially the month of new beginnings. For example the new baseball season begins. I live in Illinois and the Cubs winning the World Series has been a big deal. We love our Cubbies and whenever we have the chance we go and see them play. Last Saturday we drove to Milwaukee Wisconsin and saw the Cubs beat the Brewers. For those of you who have never been there it is an hours drive from Chicago making it an easy drive and I love the stadium. The majority of fans were Cubs. We got to go with my entire family making it a special day. What is better than baseball gardening and sometimes arrives in the spring? Babies. My daughter and her husband are having their first baby this summer. I got to spend some time with her this weekend and she looked wonderful. Babies are the best. I love the way they smile and look and smell. Life is good. Spring is here and looks like it will be quite a special year. Every Midwesterner knows that spring is like a teeter totter. The temps go up then they go down. Just when you put away all your winter gear the temperature drops like a rock. This spring/winter has been no exception.Tonight the sky darkened and the heavens let loose. Hail bounced off the table and chairs like ping-pong balls escaping from a container. Well I’ll take this over a tornado any day. Spring weather has been an obsession with every gardener I know. In fact my daughter in law never watched the weather channel until she met us. Working outside is liking being freed from winters home arrest. We get to smell the fresh air, feel the spring winds on our face and watch for the signs of spring. Rainy nights and lightning never scare me. But give me a storm capable of producing a tornado and I’m heading to the basement. I have been through many heart pounding, adrenaline rushing, storms. The tornados have always missed my home but tore through neighborhoods, fields and power lines nearby. Country kids find unique places to play. Springtime with its warmer weather and green grass were heaven-sent for a little girl from the Midwest. One of my favorite secret places to play was under the lilac and bridal wreath shrubs. I could hide and play for hours under white clouds of cascading flowers. I dreamed of becoming a bride some day and having lilacs and lily of the valley as my flowers. Woody plants are long-lived and can provide color, shade and shelter for animals as well as humans. Shrubs need ample space to grow, unlike flowers, shrubs grow and mature to twice their size. Shrubs come bare rooted or container grown. A big no- no is planting a shrub too deep, in fact it is the main cause for plant failure. The hole should be twice as wide as the plant but not too deep. The line of soil in the container should match the soil around the shrub. Backfill the hole with top soil and top with mulch. Don’t forget to water and you will have a beautiful shrub for years to come. Shrubs and trees should be planted in the spring or fall depending on the species or variety. Taking your time and following these steps will insure success! Lilacs, bridal wreath and forsythia top my list of favorite easy to grow shrubs. You can find them at your local nursery. Living in Illinois lilacs can be found in many landscape. They are a late-blooming flower in the north. Easy to grow and care for they come in shades of purple, pink and white. French lilacs are my favorite but they only bloom in the spring. Newer varieties have longer blooming times. I feel fortunate that lilacs grow in my neck of the woods. They do well in climates that are warm in the summer and cold in the winter. The white blossoms cover the arching branches of this shrub in early summer. Once common in every back yard I ever played in these plants are harder to find. The Spirea x vanhouttei needs full sun and not much care. The first flowering shrubs of the season are these brightly yellow covered shrubs. Easy to grow full sun plants dot the countryside. They make great hedges and can grow up to five feet in height. What is a bearded iris? The flower that my Mother and my Granny grew every spring was an Iris. Beautiful tall and purple it grows in full sun. We had a long driveway in the front of the farm-house that had a long narrow bed of peonies and iris. Each spring in May I would walk to the mail box past these flowers. They have huge flower heads with 3 petals that turn upward and 3 petals that turn down and the scent is unmistakable. 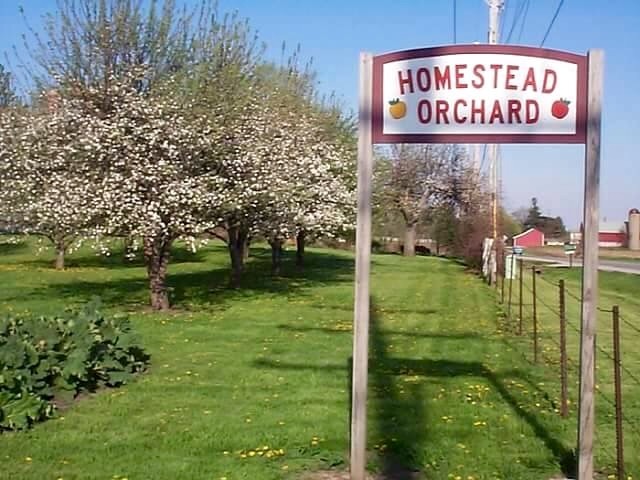 Homestead Orchard where my parents and I lived not only sold apples it sold flowers too. Each year I look forward to spring and can’t wait for the arrival of flowers like the bearded iris because it reminds me of a special time in my life. Bearded iris have a fuzzy line that runs down the middle of the petal. That’s how the ” bearded ” got their name. Other types of iris are Siberian and Japanese, which bloom later through June and July. Iris grow from rhizomes that store food for the next years growth. They grow slightly below the surface of the ground and are visible to the eye. Most nursery’s carry these easy to grow perennials and as an extra bonus they multiply and should be divided every 3 to 5 years. Where do I get my iris? I buy from a local grower in Chillicothe Illinois. Every year I stop and buy a new color or variety. The plus to buying from a local grower is they usually have a demo garden with samples of all of their flowers. These businesses are disappearing so whenever I find someone who sells some of their own nursery stock I feel like I have won the lottery. Iris only bloom for a short time but with a little care will last for years. January brings the snow and ice in Illinois. The mailman brings the anticipated seed catalogs. I dream of flowers and red ripe tomatoes. Spring also means Peonies to me. They bloom around May 26th give a week or two and then they are done for the season. They are a perennial that come up year after year after year. The fragrance is indescribable. In early spring the plants are sold at nurseries and big box stores and should be planted in full sun but will survive in partial shade. The one complaint about these flowers is they droop especially after a heavy rain. I have supports on mine to help them from becoming floppy. I can not wait for spring ! Tis the season to bake and I have included some of my favorite recipes from my grandmother Caroline Mionske. My grandmothers handwriting dots this old Betty Crocker cookbook. She loved to bake and so do I. Every year I do this in remembrance of Christmas past. Cream butter, powdered sugar, and vanilla. Stir in flour, salt, and nuts. Dough will seem to be a little dry. Make sure flour is sifted as with many old recipe this seems to still need it. Chill dough. Roll into 1 inch balls Bake until set. Cooked dough will still look white but bottoms will be light brown. Bake 350 degrees for 10 minutes. Roll in powdered sugar while still warm, then re-roll before serving. Makes 2 1/2 dozen. These cookies are from the 1980’s. Cream butter and peanut butter. Add sugar and brown sugar. Add egg, mill, and vanilla. Beat untill creamy. Combine flour, baking soda,and salt, gradually add to creamed mixture.. Chill dough. Roll into one inch balls then roll into granulated sugar. Bake 350 10 minutes until set. Remove from oven and place a Hershey’s Kiss on top. They will melt sticking to cookie. Store when completely cool and Kiss is hardened.